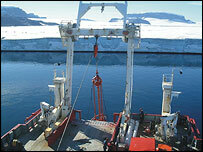 An international team of scientists is heading for the Arctic to extract cores from sediments deep below the sea bed. The team, the Arctic Coring Expedition (Acex), is part of a larger worldwide effort, the Integrated Ocean Drilling Program, which researches ocean basins. 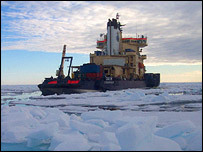 Acex will use three icebreakers as it tries to take cores from the Lomonosov Ridge between Siberia and Greenland. It says its findings will help science to work out how long the Arctic sea ice, now in retreat, has persisted. The Lomonosov Ridge, 1,500km long, rises to 800m below sea level and is topped by 450m of layered sediments. One of Acex's two chief scientists is Professor Jan Backman, of Stockholm University, Sweden. He said this "very beautiful archive" could help the team to answer its most fundamental questions: how long the Arctic sea ice had been there, when and how it had formed, and what effect the Arctic Ocean had had on global climate. He told BBC News Online: "Sea ice affects the albedo, the Earth's reflectivity, and it's very difficult to model climate change and look into the future if we don't know how much ice there was. "We don't know what role the ice has played over most of the last 50 million years in normal climate change, and in freak events. We're trying to remodel both." Climate experts do have a fairly detailed understanding of about the last 250,000 years of Arctic history, derived from cores taken from the Greenland ice cap. Acex will be the first attempt to take cores from far below the floor of the Arctic Ocean. The deepest hole planned is 500m, and if the first site provides suitable cores the team will go no further, though four other sites are available if needed. The coring vessel, the Vidar Viking, will have to maintain its position over the hole with great accuracy. It is equipped with a computer-controlled dynamic positioning system, which links multiple propellers around its hull. The other icebreakers, the Oden and the Sovietsky Soyuz, will work together to break up ice floes and push them away to make an ice-free channel around the Viking. The project is challenging because of the physical conditions: the sea ice is in constant motion, daytime temperatures are usually sub-zero, and the area is remote from technical or medical back-up. Acex's other chief scientist, Dr Kate Moran, of the University of Rhode Island, US, said: "We'll be looking at microfossils in the cores, organisms which carry a record of temperature, salinity and ice content when they were deposited." The expedition sails from the Norwegian port of Tromso on 8 August, and once in position can expect a narrow window of about 35 days of clement weather before winter sets in. From early August Acex's logbook with reports and images will be available online at http://www.iodp.de/. Over the past 30 years scientists have found the Arctic sea ice has thinned from an average of roughly 3.1 to 1.8 metres. The area it covers has shrunk by 5%, about the size of France and Germany combined.